Speaker, Author, Presenter, Survivor of the 2002 Bali bombing, her own suicidal thoughts and other personal tragedies, Carren Smith will show you how a shift in focus can morph even the stubbornest mindset. Carren’s latest retreat and training program, The Effortless Self, challenges your deepest, inner most thoughts and beliefs about yourself, helps you to experience true success on EVERY level – and find a purpose that is truly your own. Through the Effortless Self, Carren teaches how to define and connect with your passions and true purpose, so that you can then grow, achieve and feel fulfilled… Once you find this true purpose, you allow yourself to grow and expand in a way that is natural, organic… EFFORTLESS. Do you wish you could achieve more? Do you sometimes, or even regularly, doubt your own abilities? Is there an inner light inside you that is begging you to let it shine? Carren has the answers that you’re looking for! The ‘Effortless Self’ arms you with the tools to bring forth the greatest possible version of yourself! So, STOP living the life you think you should – START focusing on the life you know you deserve – and BOOK TODAY! You CAN achieve the life you’ve dreamed of, STOP procrastinating! The only person holding you back, is the one looking at you in the mirror! Intimate and powerful lessons designed to increase mental clarity, enhance inner peace and create emotional balance. Be inspired, confident and ready to experiment with new ways of Being. Once you’ve secured your spot, you will enjoy continued access to the 7 sessions through your unique username and password any time you need to revisit the online content! 7 online lessons dripping with insights from Ancient Wisdom and Modern Mystics! 7 Habit Helpers to Get You Started Immediately! This lesson will help you to look inward to discover your awareness. When we explore and sharpen our awareness, we find that growth and expansion happens effortlessly and we begin to create our lives the way we want it to be rather than life being a random set of happenings of which we have no control or say. The powerful content of this lesson is designed to help you understand the nature of inner awareness, why it’s the most vital key to potency in every area of your life and how you can maintain awareness and observe your experiences throughout the day. By far, love and relationships (along with money) are the most challenging and elusive qualities in life and while for some, our ability attract them may be potent, our sustainability is always fraught with turmoil. In this lesson we question the meaning of love along with its external origin. We dive deep into the experience and expression of love and dissect its relationship to expectation, projection and needs. Could it be possible that we’ve never truly experienced love before? Could it be that we’ve become so accustomed to our conditioning that we don’t know the difference between love and fear? Let’s find out together! If you had a relationship with a human, that is similar to the relationship you have money….. Do you think they would stick around? Neediness, desperation, worry, anxiety, drama, manipulation and desire….. These are all words that have been associated with money and it’s time to unlock the truth behind the Law of Attraction and manifestation. You have been maneuvered into a thought system that benefits everything and everyone but YOU. Beware…. The Exposé is on the way! When we look at the body for health and wellbeing, we see ourselves in parts. Our lungs, our heart, our leg, toes, arm etc…. But the body is designed as a holistic vessel requiring harmony from head to toe. In this lesson we explore health through Eastern Philosophies and uncover the Source of illness as well as what can be done to restore the body to a condition of lean, light, agile and unified. Disclaimer: Nothing in this lesson is intended to replace medical or psychological advice. In this lesson we discuss the very nature of human purpose along with its relationship to happiness and fulfillment. We explore how today’s hectic lifestyle is the primary thief of purpose and how your inner tutor (intuition) is the way ‘in’ to your greatest experiences. Raising a family is one of the fundamental gifts of being human along with the most challenging of assignments. To find family harmony can be difficult with conflicting priorities, personalities and puberty! In session six, we explore The Work of Byron Katie and introduce the most potent parenting tool available today. With ease, effortless love and freedom afforded to each member of the family, the dynamic is enhanced and the experiences are transformed almost instantaneously! As part of the Universal intelligence that beats your heart and breaths you, we give you powerful tools to find yourself infinitely connected to humanity and to nature itself. Transforming your world from being ‘outside in’, to ‘inside out’, your connection and involvement with all that exists will become your primary source of inspiration and creativity. Recognising that YOU are the centre of the Universe and your world is a construct of your own making leaves you free to change what you’d like, and keep that which serves you. Knowing the difference between what is you, and what is NOT you, is the key to Effortless Expansion! Be prepared to discover the inner peace that only self-enquiry brings! As the founder of ‘The Work’, Byron Katie opens up in this exclusive interview with Carren as they explore some of the most common issues that hold humans back while keeping them trapped in circular and conditioned thinking. Author of ‘Loving What Is’ Byron Katie, explains the process of inner enquiry and how the existing circumstances can be the springboard to the ultimate desire of freedom and happiness! Guided meditations recorded by Carren Smith take you on a soothing journey into the Self. Using basic Transcendental Meditation techniques these three meditations will bring quiet to the mind, love to the heart and peace to the Soul. Seven short recordings, one for each day of the week, to help prepare your mind for an empowered and potent day ahead. Each recording is thought provoking and encourages you to question your habits, perceptions and beliefs. Have you ever wanted to know the secrets to inner strength, resilience and tenacity? Dive deep into Carren Smith’s journey with your signed copy of her book, Soul Survivor. Overcoming the adversity of suicide, the 2002 Bali Bombing, death and her own battle with depression, Carren reveals the recipe to creating a life worth living! As 3 inspiring PDF articles, these short reads are guaranteed to be thought provoking and unique. Examining your relationships with yourself and your significant others you will see behavioural patterns that if explored, could transform the way you experience yourself and those you love most. Let’s face it, love relationships come with challenges from time to time and being equipped with enhancement tools is the best way to find ease and flow in every day love and life! If success and happiness are your ultimate goals, you’re in the right place. If you’re still reading, it’s probably safe to assume that you are searching for an answer… That you’re tired of hearing that voice in your head telling you that you’re not good enough – and that you’re ready to reach your full potential – you just need a leg up! It’s likely that your dealing with some personal demons, some painful memories or even some guilt or fear you’re carrying around, that you feel is holding you back. This state of mind can be overpowering and exhausting – and it’s a feeling that Carren Smith is all too familiar with. It’s ok to feel like these things are weighing you down – in fact, it’s a good thing! Acknowledging that there is something missing from your life is a huge step. It means that you’re ready to discover what it is that you CAN achieve and how to go about doing it! You mightn’t even be sure what it is that’s going to help you feel that sense of fulfilment and purpose. And that’s more than ok too. That, among so many other things, is what The Effortless Self will help you discover. Close your eyes and imagine getting up in the morning. You go through your regular routine; shower, breakfast, coffee/tea (depending what you’re into) – as you reach the bathroom and look in the mirror, rather than seeing the ‘regular you’ that you’re disappointed with or disheartened by –picture seeing an ‘extraordinary you,’ a YOU that you can’t help but be madly in love with and proud of. This is where The Effortless Self invites you. THIS is the you that CAN be revealed. You CAN be THAT person in the mirror. You can feel pride over discouragement! It’s simply a matter of taking the first step. “I have been where you are now. I have experienced the same feelings of doubt and discouragement – of hurt and guilt. Through my own experiences, I will help you find your way out, to take you to that next level of life that you can hear calling out your name. You just have to be willing to move forward. WHAT’S THE BUZZ AROUND THE EFFORTLESS SELF? Hi, I’m Carren Smith and yep, I’m a real person! Sometimes the internet can be a little cold so I wanted to write you a personal note to let you know you can talk to us if you’d like! I’m super grateful you’re on this page with me and I’d like to encourage you to take the leap of faith – as together we bring your greatest life into the here and now. Learn the importance of being present while envisioning your future! This and so much more that is on offer in The Effortless Self Program and the best of your life is yet to come! Join me and 20 others as we embark on a journey of living effortlessly through the exploration of Oneness, Enlightenment, Miracle Minded Manifestation and Inner Bliss! It’s time for you to be the Director in your own story of life! If you’d like to find out more, we’d love to connect with you! Simply send our team an email to info@carrensmith.com where we are waiting to chat. Or, better still, pop your question into the Pop Up Chat Bar on this page and we will be with you shortly! Will my accommodation and food be included? We have catered for your every meal during your stay at the 2 day retreat and your accommodation will be covered on Thursday, 5th October 2017. We will finish around 10pm on Friday 6th October, 2017. Will my dietary requirements be catered for? Absolutely! Carren is a Vegan and we will have Paleo, Gluten Free, Grain Free, Sugar Free options available. Just be sure to let us know in response to your registration email and we will take care of everything for you. I can’t make the Retreat dates for 2017? Go ahead and book yourself in to take advantage of the 2017 rates! We will announce the 2018 Retreat dates in the coming months. Be sure to advise us immediately that you’re unable to attend as we will be unable to transfer your registration without a minimum of 20 days notice. This event is for everyone!! If your partners would like to come along, simply let us know as soon as possible as we only have a very limited number of rooms available for couples. How do I get to the venue from the airport? There are a number of transport options available to you including taxi and shuttle bus services. We will provide you with the contact information of various local service providers upon registration. Unless you have booked as a couple with your signifcant other, you will be sharing a 2 bedroom cabin. Each cabin has 2 rooms with their own ensuites and a shared lounge area. 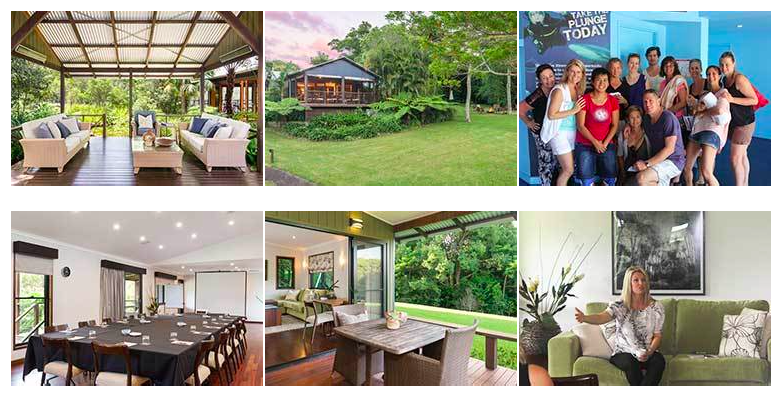 The accommodation at Spicers Tamarind Maleny in the Hinterland of the Sunshine Coast is Five Star and spectacular as each cabin overlooks the stunning gardens and is a short walk to gorgeous waterfalls. This is one of the most incredible locations on the Sunshine Coast. Absolutely yes! We have a full 100% money back guarantee on our programs making your investment completely safe! Can I start straight away with the bonus videos and meditations? You bet! Carren is super keen to get you off and running straight away. There is no need to wait. As soon as you’ve registered, you’ll gain immediate access to all of the online material as well as the online forum where you can begin asking questions. How is this program different to other self development programs? The Effortless Self is completely unique as our approach assumes the Self requires no ‘development’, instead, it requires recognition and awareness and in return, life becomes ‘effortless’. There is no more ‘hard work’ to do to achieve the life you desire. There is no more goal setting, no more ambition, no more competing, no more struggle street. Discovering the path to an Effortless Self is the very key that unlocks the results you’ve been thirsting for by using the Law of Attraction, Reciprocity, and every other Universal Law you’ve been drawing on to create more of what you want. It’s time to do it Effortlessly! How many people will be at the retreat in October 2017? Our venue is very intimate and only 20 places exist for The Effortless Self Luxury Retreat. You will be amongst a group of like-minded people all ready to leap to the next level of life and your interaction with Carren will be up-close and very personal! A rare opportunity indeed!